Chris O’Hare has insisted he won’t be running scared when he starts his Olympic bid in today’s 1500 metres heats, even though it’s odd-on that the Kenyans and Ethiopians will be packing out the podium. The 25-year-old from West Linton comes into Rio hoping that the knee injury he picked up in training in France last month won’t be the factor it was when he traipsed in dead last at the recent Diamond League in London. But the Edinburgh AC hope claims it’s the final or bust after pep talks from home that have him vowing to make a name for himself. “I’ve talked about having a terrier attitude,” he said. “That’s one my Dad and I have always used because I had two fox terriers growing up. 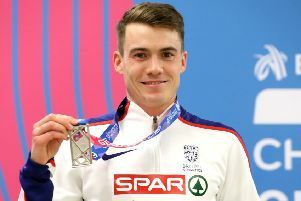 Since turning professional after leaving university in Oklahoma last year, the two-time European bronze medallist admits it’s been all-go with a move to Boston to a new training group and settling into married life with wife Meredith, who’s expecting their first child later this year. There’s little time for anything other than eating, running and sleeping, he reveals. Which has meant knocking the visits to kids hospitals he used to do on a regular basis in college on the head with not enough hours in the day. He said: “It’s funny, I always thought when I went pro I’d have more time. I have less time, because I’m doing more. We leave the house at 8.30, I get back at 2.30, then it’s lunch, relax and then out for a second run before making dinner for when Meredith gets back from work. By 7, I’m ready for bed. After missing out on London 2012 when he failed to get the qualifying mark, O’Hare’s vowed to make the most of his stint in Rio – with a heat and a semi standing between him and a spot in Saturday’s final. But going to one Olympics as a fan, he reveals, left him fired up to make sure he’d have a better view this time around. Meanwhile, 1500m star Laura Muir is one race away from capping off the best season of her career in style. Despite finding herself drawn in a semi-final with 2015 world champion Genzebe Dibaba, the Dundee Hawkhill Harrier crossed the line third in 4:04.16 minutes behind Dibaba and Sifan Hassan. That was good enough for fourth fastest overall with Kenyan Faith Chepngetich Kipyegon the other athlete to run faster in the semi-finals. That performance should come as little surprise however judging by this season’s results, which include Muir successfully defending her British 1500m title before going on to break Dame Kelly Holmes’ 12-year-old national record when she won the Anniversary Games in 3:57.49 minutes. “I just wanted to qualify for the final – you always speak about an Olympic final but it’s just an achievement to get there,” said Muir. “I’m really chuffed. I tried to save as much energy as possible. I knew I wanted to stay at the back at the start and stay out of harm’s way and then come through and be at the front before anything happened. A medal of any colour would represent Muir’s first major senior international podium finish, with her personal best time over five seconds faster than the times recorded in the semis. Elsewhere, Great Britain’s Sophie Hitchon claimed bronze in the women’s hammer.